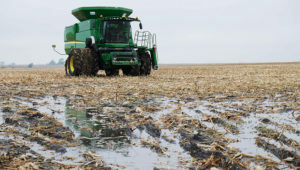 The weather continues to make it tough for farmers to get into their fields to harvest beans and corn. The U.S.D.A. crop report says there was barely one day (.8) that was suitable for fieldwork last week with the continued rain and snow showers. The report says only one percent of additional soybeans were combined in the week that ended Sunday. That puts the total bean harvest at 19 percent — which is 11 days behind the average — and the lowest amount of soybeans harvested by this date since they started keeping records. The corn harvest advanced only two percent in the last week — to 17 percent overall. That’s 4 days ahead of last year, but 4 days behind the 5-year average.